Growing up in South Manchester has given me a strong affinity for shooting weddings in my amazing home town. The ever-changing cityscape, the diversity of its people and the vibrancy of its culture is something that I enjoy greatly on every visit. Weddings in the centre of the town are always great fun, unique and attract a diverse range of couples. We’re very lucky to feature a great number of stylish, majestic and unique wedding venues and it’s been a pleasure for me to visit and take part in these weddings. If you have decided to get married in and around Manchester then you have certainly made a great choice, as there are many fantastic venues to accommodate a unique and beautiful wedding. I have worked in some truly stunning locations for wedding photography in Manchester that lend themselves to fantastic photographic opportunities. If you are still looking for ideas for a venue, then please check out some of these suggestions based on my personal experience. The ideal venue for you will, of course, depend on your personal preferences. The tricky bit is narrowing down which one of these fabulous venues to choose. This boutique townhouse hotel offers individuality for the brides and grooms that value a one-off experience. Located centrally, the Great John Street Hotel oozes opulence and style. Functions held here benefit from a chic and sumptuously decorated downstairs oyster bar, elegant rooftop lounge and beautiful rooftop playground (for grown-ups), if you are lucky enough to get a warm and sunny day. This luxurious venue really lends itself to a brilliant collection of eclectic wedding photographs thanks to the quirky and unique decor. A wedding at Harvey Nichols has to be one of the greatest statements of luxury. In terms of wedding photography in Manchester, this is a truly great space. From the Second Floor venue, wedding guests will enjoy panoramic views across the city and your wedding photographs will benefit from all of the lovely natural light that the function room is bathed in. The vibe is contemporary and stylish as you would expect from a brand like Harvey Nichols. Bespoke packages are available but whichever theme you choose, you can be assured of a wedding with an abundance of elegance and glamour. King Street Town House markets itself as a baby grand hotel and it is easy to see why. It has all the features of a large luxurious hotel chain, packed into a small but perfectly formed venue. The King Street townhouse is located in a gorgeous Italian Renaissance building that has stood in the city since 1872. Historically beautiful on the outside, the King Street townhouse offers thoroughly modern hospitality inside. As a wedding photographer in Manchester, I adore the opportunity to include both the opulent exterior and lavish interior into a portfolio of wedding photographs. The King Street Town House is recognised as one of the best hotels in the world by Conde Nast and I’m inclined to agree. The Victoria Warehouse offers what is to my mind a true Manchester experience. This is a historic building that offers an authentic industrial backdrop that cannot be found in many places in the world. It also offers a huge space for you to hold the biggest and best party you have ever thrown. A wedding photographer’s dream, there are nooks and crannies throughout this grand building that are ideal for quirky and unique wedding photography in Manchester. Your package can be entirely innovative and tailored to your specific requirements. A beautifully preserved and surprisingly romantic spot for a true Mancunian wedding. This modern space on Salford Quays is a fun and unique venue to hold your wedding. The wedding function room is surrounded by glass with panoramic views over the Manchester ship canal. 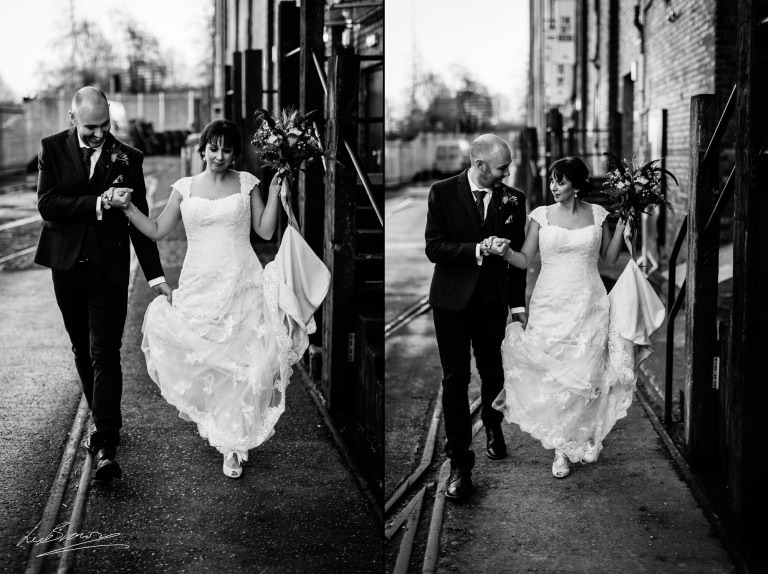 Perfect for wedding photography in Manchester with beautiful natural light and iconic landmarks, another real taste of the city with a splash of culture thrown in for good measure. Going for Grandeur In Manchester? If you are hoping to make a statement with a grand and majestic venue then you may wish to check out some of these beautiful venues that really lend themselves to spectacular wedding photography in Manchester. Built in the mid 19th century, Gorton Monastery is a majestic building with a fascinating history. It is also an award-winning venue for events. Built-in a neo-gothic style, it is truly breath-taking and an amazing setting to create memorable wedding photographs in Manchester. There is an abundance of grand old buildings in this historic city, but the Radisson Blu Edwardian is one of the loveliest. Formerly a Free Trade Hall, this hotel has been lovingly refurbished to provide a luxurious and romantic venue for a wedding, with many opportunities for beautiful wedding photography in Manchester. A relatively new venue on the wedding scene, the refurbished Freemasons Hall is a truly stunning venue for your big day. The grandeur of the room creates the perfect backdrop for wedding photography in Manchester. Period features combine with modern twists to include oak panelling, gloriously high ceilings and a floating staircase which is just begging to be photographed. Imagine gliding down there with your new spouse! The iconic Midland Hotel is one of the most prestigious places to hold your wedding in Manchester. A grand old venue in the centre of the city, the Midland continues to be a draw for both visitors and locals. The gorgeous Grade II exterior and luxurious rooms within provide a wealth of opportunities for beautiful wedding photographs. Manchester Museum would probably win the award for the most unique wedding photograph opportunities in Manchester. With Stan, the huge T-Rex fossil overseeing the wedding ceremony, your special day is sure to be one that nobody will forget! Located on the university campus and housed in a stunning neo-gothic building, Manchester Museum is a winning venue. For those of you who are seeking a quirky and creative backdrop, there is no shortage in Manchester. How about one of the following unique venues? Art aficionados will surely appreciate a portfolio of wedding photographs featuring work by world-renowned artists. Wedding ceremonies are held amongst the collections in gallery 16 whilst reception drinks take place amongst the romantic pre-Raphaelite paintings. A very classy and distinctive experience. A centrally located Grade II listed grand building in Manchester, the Albert Hall is a premier live music venue. A few years ago, it also began hosting weddings in Manchester. You can have the wedding ceremony, the drinks, the food and the party all under one roof at the Albert Hall, overlooked by magnificent stained glass windows. Guests will also enjoy exploring the ornate vestibules and gazing in wonder at the impressive ceiling arches. These features also, of course, make for some wonderful and unique photographic opportunities. A brilliant venue for Manchester wedding photographs. Oddfellows on the Park is a 5-star hotel set in the glorious Bruntwood Park, with beautiful natural wedding photography opportunities aplenty. Recently renovated, Oddfellows is a fresh and exciting venue that offers the very latest contemporary luxury combined with beautiful period features. Another relative newcomer to the wedding venue scene, the recently renovated Victoria Baths offers a unique and historic venue to hold your wedding in Manchester. This large open space gives a dramatic touch to your wedding day. Choose to get married in one of the pools themselves (without the water, obviously! ), or the Turkish restroom adorned with beautiful stained glass. This is an event space that can be gloriously transformed to match the theme of your dreams. Truly a part of Manchester’s history, Victoria Baths are a stunning option for your special day and provide a stunning backdrop for Manchester wedding photography. Now a prestigious music school, Chetham’s has hundreds of years of fascinating history to discover. Founded in the 15th century, many famous historical faces have spent time in Chetham’s library, including Marx and Engels who worked on the Communist Manifesto in its very rooms. An atmospheric and completely unique venue, Chetham’s school of music is a wonderful place for a wedding. The Baronial Hall is one of the best examples of a 15th-century medieval hall that exists today. That’s a pretty special claim to be able to make on your wedding day, and with a great wedding photographer in Manchester, you’ll be able to look back on your day with all the spectacular detail captured forever. As well as some wonderful wedding venues, Manchester offers some of the most unique and fun hen and stag experiences in the UK. Here are a few ideas to set your wedding celebrations off with a bang. Craft Beer. The Craft Beer scene has exploded in Manchester. There are fantastic little craft ale houses popping up on every street corner. How about a tour around some of the premier ale houses or an individual craft beer tasting event at one of the northern quarters most stylish venues, Cane and Grain? Escape room. How about an escape Room challenge to help people get to know each other before heading out on the town, perhaps to some of the premier cocktail establishments in Spinningfields? The Birdcage is a Manchester institution, offering a unique cabaret experience featuring drag artists, dancers and plenty of disco classics. Booking is recommended – it’s a popular place, but for good reason! You could take your hens and stags back to school at Manchester Three Rivers distillery for a very different kind of education. Learn how to produce gin and then, of course, enjoy a tasting after all your hard work. Bottomless brunches are all the rage and a brilliant start to your hen or stag weekend. Fill your boots with unlimited food and drink to set you up for the day. For the sporty types, how about some golf, bowling or darts? Manchester has a wealth of bars combining food and drink with a little sporting activity on the side. Loads of fun and a great way to pass an evening. Spas and afternoon tea. I could write a whole other article on the best places to go for afternoon tea or a relaxing spa day. Manchester does this well. There are some amazing options for a hen – or stag – to get pampered and then loaded up with tea and cake. The conundrum of moving guests from one venue to another in Manchester can seem quite daunting. However, with some careful planning, you can actually make it part of the fun. How about hiring your own personal tram to carry the wedding guests from the ceremony to the party? Unique, exciting and fun. You could also hire a wedding bus for your guests! Vintage double-deckers are particularly popular, especially when they include a personalised message on the front. As a wedding photographer in Manchester, I always enjoy the photo opportunities that a big red bus presents. Depending on where your venue is located, a boat could even be an option. With its network of canals, there may be an opportunity to add a party boat into your wedding day plans. You only have to wander around Manchester for a short time to realise that there are a huge number of beautiful churches in the city. The most outstanding of these has to be Manchester Cathedral, located in the city centre. Built in a gothic style, Manchester Cathedral is both beautiful and dramatic. You have to meet some fairly strict criteria to get married there, but it is a possibility and think of the wedding photographs against this grand backdrop. St Anne’s Church is also located centrally but is an older neo-classical building. It is grade 1 listed and truly fascinating to look at. 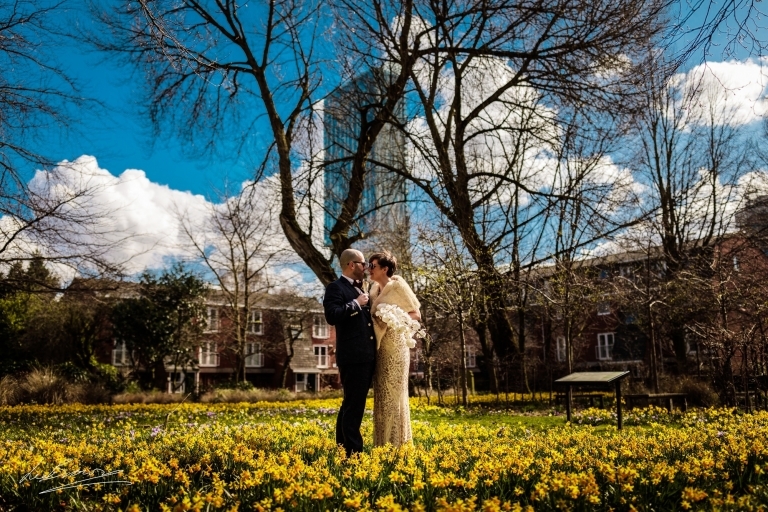 You also have the advantage of walking out of your wedding ceremony into the lovely St Anne’s Square which is brilliant for photographic opportunities. Or, St. Mary’s Catholic church is a hidden gem in the centre of Manchester. It is a peaceful and beautiful church that people visit from far and wide. Alternatively, Halle St Peter in the recently rejuvenated area of Ancoats comes highly recommended thanks to a recent transformation. It has actually been deconsecrated but has benefited from a multi-million-pound restoration project to turn it into a grand setting for elegant occasions. With all this to tempt you into a wedding in Manchester, there’s really no reason to look elsewhere – especially if you’re a local. But with the huge array of stunning backdrops, from quirky to majestic, one thing is for sure – as a wedding photographer in Manchester, I can make each and every couple’s photographs, no matter where they are set, a stunning recollection of a beautiful day. If you love the idea of getting married around Manchester and would love more information, just get in touch! I would love to hear all about your wedding day plans!